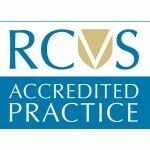 The Coach House Vets is accredited to the RCVS (Royal College of Veterinary Surgeons) Practice Standards Scheme. 24-hour emergency cover for patients. Have appropriately trained staff for work undertaken (all staff must receive adequate training; vets and nurses must also continually undertake further training to keep up with developments in veterinary medicine). Comply with standards of cleanliness and hygiene. Have essential diagnostic and surgical equipment for the work undertaken – these must be appropriately installed and maintained. Have appropriate facilities for hospitalisation of in-patients and nursing care with minimal risk of infection. Have an effective policy for communication with clients. Have safe storage and dispensing of medications. Have full compliance with all appropriate health and safety legislation.